African Americans have long been less likely than whites to use the internet and to have high speed broadband access at home, and that continues to be the case. Today, African Americans trail whites by seven percentage points when it comes to overall internet use (87% of whites and 80% of blacks are internet users), and by twelve percentage points when it comes to home broadband adoption (74% of whites and 62% of blacks have some sort of broadband connection at home). At the same time, blacks and whites are on more equal footing when it comes to other types of access, especially on mobile platforms. In addition, the gap between whites and blacks when it comes to traditional measures of internet and broadband adoption is more pronounced among certain demographic subgroups than among others. Specifically, older African Americans, as well as those who have not attended college, are significantly less likely to go online or to have broadband service at home compared to whites with a similar demographic profile. African Americans age 65 and older have especially low adoption rates compared with whites. Just 45% of black seniors are internet users, and 30% have broadband at home (among white seniors, 63% go online and 51% are broadband adopters). On the other hand, young, college-educated, and higher-income African Americans are just as likely as their white counterparts to use the internet and to have broadband service at home. Some 86% of African Americans ages 18-29 are home broadband adopters, as are 88% of black college graduates and 91% of African Americans with an annual household income of $75,000 or more per year. These figures are all well above the national average for broadband adoption, and are identical to whites of similar ages, incomes, and education levels. Overall, 73% of African American internet users—and 96% of those ages 18-29—use a social networking site of some kind. African Americans have exhibited relatively high levels of Twitter use since we began tracking the service as a stand-alone platform, and this continues to be the case—22% of online blacks are Twitter users, compared with 16% of online whites. Younger African Americans in particular have especially high rates of Twitter use. 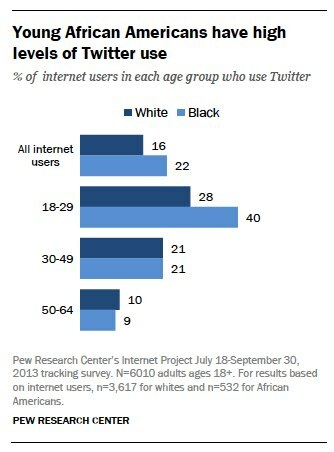 Fully 40% of 18-29 year old African Americans who use the internet say that they use Twitter. That is 12 percentage points higher than the comparable figure for young whites (28% of whom are Twitter users). In contrast to internet use and broadband adoption, blacks and whites are equally likely to own a cell phone of some kind, and also have identical rates of smartphone ownership. Some 92% of black adults are cell phone owners, and 56% own a smartphone of some kind. Cell phone ownership is much more common than internet use among older African Americans. Just 45% of African Americans ages 65 and older use the internet, but 77% are cell phone owners (most of these seniors own basic cell phones, as only 18% are smartphone owners). Overall, 72% of all African Americans—and 98% of those between the ages of 18 and 29—have either a broadband connection or a smartphone. The findings in this report are based on data from telephone interviews conducted by Princeton Survey Research Associates International from July 18 to September 30, 2013, among a sample of 6,010 adults ages 18 and older. Telephone interviews were conducted in English and Spanish by landline and cell phone. Findings for African Americans are based on the 664 respondents who identified themselves as black or African American, and not of Hispanic or Latino background. In the interest of readability, throughout this report African Americans are compared only to whites, and not to other racial or ethnic groups. The Pew Research Center’s Hispanic Trends Project has collected data recently on technology use among Latinos, which can be found at https://www.pewhispanic.org/. Additionally, we do not report findings based on geographic location because the number of rural African Americans in this survey (n=75) was too small to report.